Just how much has the United States depended on immigrants to build itself throughout its history? 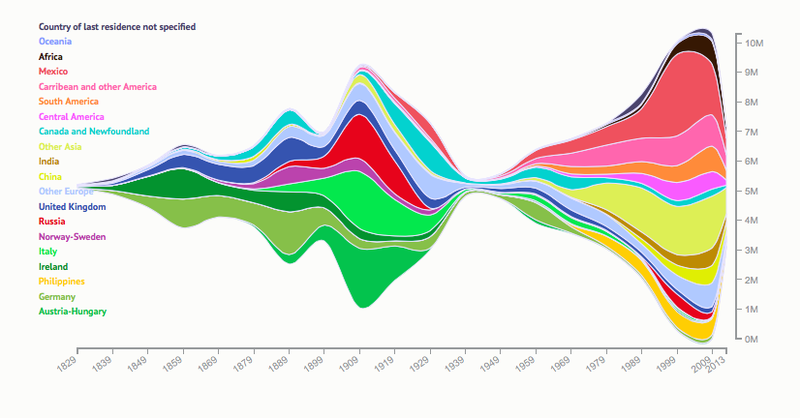 This chart lays out the last few hundred years of the nation's immigration rates to show how pivotal it was. The work of Natalia Bronshtein of Insightful Interaction, this chart uses data from the Department of Homeland Security's Yearbook of Immigration stats, and it shows not just immigration growth and contractions, but where that immigration is occurring from. It's also an interesting look at the ways that global history has changed the tide of immigration. While immigration continued through the first World War, you can see a brief chocking off of the flow of new Americans extending through the second World War. When it kicks off again, the points of origin of those new Americans has shifted, with several countries that previously had populations too small to show up on the graph (India, China, the Philippines) now taking a prominent place. You can see the full chart right here.